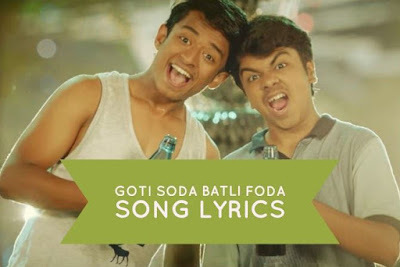 "Goti Soda Batli Foda" Song lyrics From The Movie Boyz 2 song sung by Adarsh Shinde and Rohit Raut. Music and Lyrics composed by Avadhoot Gupte. Hope you will enjoy the Lyrics of this Song! Also Read: New Marathi Song Lyrics "Aila Aala Re Sachin"
अल्लादिनच्या दिव्याला ऐवढी मोरीतली राखुंडी फासा!